This week I want to spend some time on Distress Tolerance. Have talked extensively on our emotions and the role that they play. 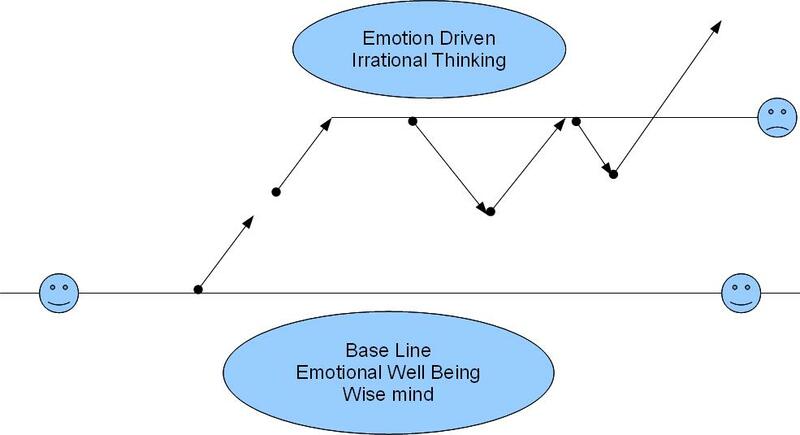 Now, when our emotions are rising and we are off baseline, as the above diagram shows; we need to make a distinct effort to control them, we need to make sure that that effort is well thought out, organized and effective. 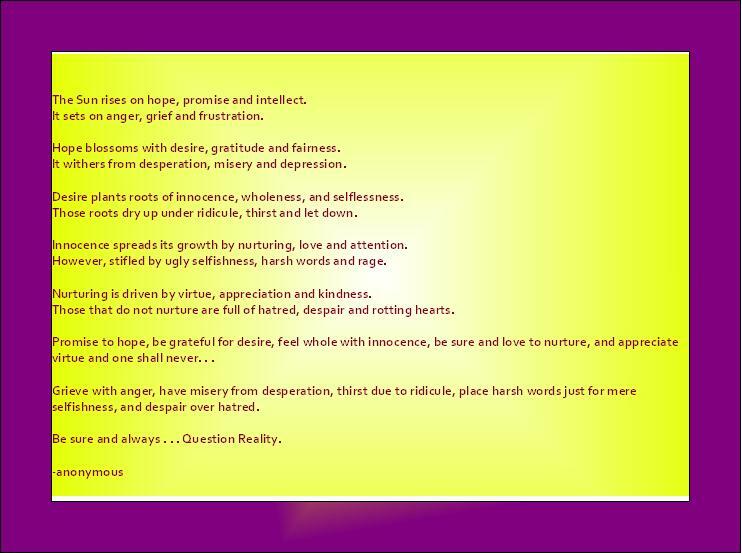 Obviously we cannot possibly think through our distress tolerance while we are in an elevated emotional state. Therefore, it is our responsibility to design a distress tolerance plan. I purposely say "our responsibility" because we may have special needs due to mental illness but that does not give us a free pass to inflict ourselves on those around us. Here is one of my favorite dialectics "I am doing the best that I can, AND I need to do better." This means that although I struggle, and it is hard and painful for my loved ones around me, I am working at this 100%, and I look forward to the improvements I will be making along the way. I may not be perfect at this, I may blow up and engage in target behavior, but since I am using my skills, I am being responsible with my own mental illness, taking ownership of it, I can feel confident that I am doing the best that I can. Mindfulness is the purposeful getting in touch with how our mind and body are functioning together in any given situation. It is of particular usefulness when we are elevated emotionally. But it is something that we should be practicing daily, so that we are able to help keep ourselves closer to baseline, and if we do rise above baseline, then we will be skilled enough with mindfulness that it will be successful. An example of mindfulness is to sit in a comfortable chair, close your eyes, after a few deep purposeful breaths, start counting the sounds you hear around you. Do not linger on what the sound itself was or could be, rather simply count it and move on to the next sound you hear. Do this for about 3-5 minutes. Afterward open your eyes and discuss with yourself what it is that you noticed about the exercise. Often times you will notice that you are more aware of your surroundings, over time practicing this mindfulness exercise or similar ones, you will also begin to notice your body and how it feels in different environments. Whether we are skilled at mindfulness or not, we can use the bi-products of it to help with our distress tolerance plan. Knowing our limitations and our strengths can greatly assist in this plan as well. The first step in my plan is to take a shower. The water drops on my body help the tension inside my body to ooze out through my toes. I have become trained at this, so now if I am in a situation when I cannot take a shower, splashing water on my face can trigger the body sensation of oozing tension just from the chilly water on my face! Which is nice because not am I in a position to shower whenever I get excitable, but usually there is always a faucet for me to at least splash my face. This buys me time so that I can plot my next move. I seem to have a hard time reducing my vulnerabilities, but I do know when I get elevated, the first thing I need to do is rub lotion into my feet. Most of the time I can do this anywhere. I just carry lotion where ever I go. What works best for me is praying about my problem. Almost repetitively. A few phrase that remind me of some of my skills that I am not able to use at that moment, but I know I want to, I just pray. When I stop what I am doing to pray, it almost always forces me to breathe slower. The combination helps me to stay calm until the intense moment has passed. My notebook and a favorite pen are my best companions. I can jot down the distressing event. It helps me to really get to the meat of the problem, and because I have with me other entries I can draw on what I have written in the past. I use it to remind me that no one moment will last forever and that I have got through things like the current situation in the past. I like to draw pictures, either abstract or specific things, it is so completely different from what is happening in the moment that I think it sort of pushes a reset button in my head. My heightened moments seem to almost always involve my husband. It is like we just can't seem to deal with certain topics and we fight about it. With my mental illness when our fights hit a certain level, I go crazy. So what I have learned to be my first line of defense when I get elevated is start a pros and cons list. Pros of pursuing the conflict vs. cons of pursing it. Or, pros vs. having to bring up a topic I know will cause conflict vs. not discussing it. etc. These are just a few expressions, I am sure there are so many more good ideas out there. Also, these are just some ideas of the first steps of each of their plans, I purposely did not list all steps because I felt it important for our readers to get ideas so that they can formulate their own plan. Get you thinking about what you personally could use. As I mentioned at the outset, this plan needs to be done in advance of a heightened experience. Be prepared! Make a list of a few things that you know work, and work through them like a check list. Something that was mentioned was high conflict. This is very common with mental illness, especially with those that suffer BPD. Often times with high conflict relationships it is due to an inability within ourselves of knowing when we can or cannot say "no" to something. Or perhaps we needed to request something of a person, but did not. This can produce for us an imbalance in the environment and if our vulnerabilities are heightened or our body memories of how many times we have fought over a subject we engage in conflict. So, next week, we will talk about Interpersonal Effectiveness in whether or not we try and change a situation or whether we accept the situation as it is and let it go. Once again, please submit writings, I would like to share some each week for awhile. Until next week!